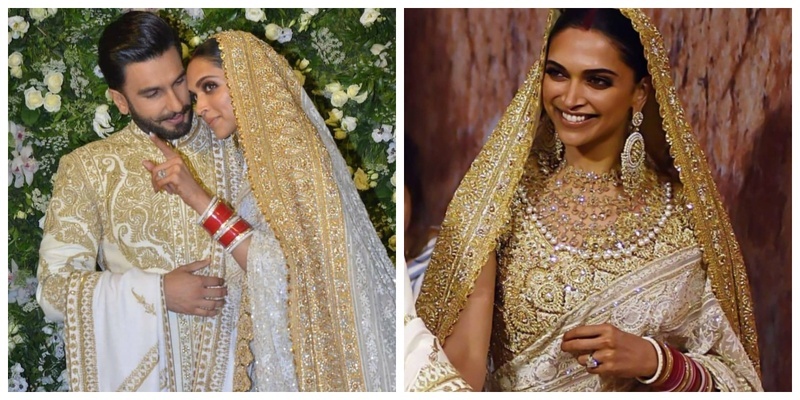 All the exclusive Pics & Deets from Ranveer Singh and Deepika Padukone's Mumbai Reception! Newlyweds, Ranveer Singh and Deepika Padukone have been in a celebratory mood since they got hitched in Italy earlier this month. And now that they are back in Mumbai post their Bangalore reception and days after their Epic Mumbai party thrown by Ranveer’s sister Ritika, the couple broke the internet last night too! Last night saw the Bollywood sweethearts’ second reception and their first photos were nothing short of royal. In fact, the two look like real-life Bajirao and Mastani, don’t you think? Deepika looked a vision in white wearing an ivory and gold chikankari saree and jewels by Abu Jani and Sandeep Khosla! Ranveer on the other hand looked dapper in a Rohit Bal attire complimenting Deepika’s outfit totally! How cute is the ‘R’ and ‘D’ bouquet they received from the media? We spotted Ranveer on his best behaviour in each of the wedding functions - the Italy wedding to his Bangalore reception! Although, slowly Ranveer is seen turning on his ‘offbeat’ avatar and being in his element. He was spotted displaying his quirky side at his sister Ritika’s bash, earlier this week and the Mumbai reception he was ALL HIM! He was spotted near the DJ’s console, checking out songs on the laptop and perhaps selecting his favourites, by artistes like Robbie Williams and Jason Derulo. Well well, what celebrations are yet to come only time will tell, here’s awaiting their Bollywood reception-bash though!